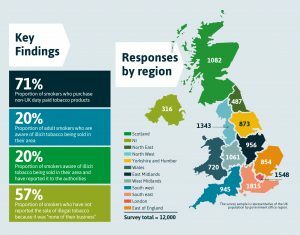 In June 2017 the TMA commissioned a nationwide survey of 12,000 tobacco consumers’ (18+) awareness, behaviour and attitudes towards illicit tobacco. This includes full breakdowns for each of the UK regions including Scotland, Wales and Northern Ireland. The questions received input from HMRC and other stakeholders such as the media. This survey followed and supplements similar surveys conducted in the same manner in 2015 and 2014. 73% of tobacco consumers who purchase non-UK duty paid tobacco products. 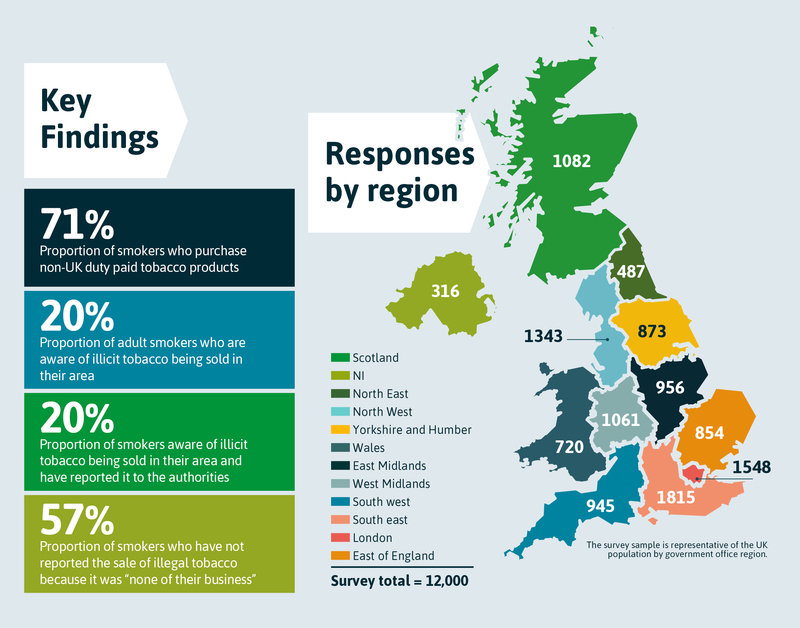 20% of adult tobacco consumers are aware of illicit tobacco being sold in their area. 12% of tobacco consumers who are aware of illicit tobacco being sold in their area have reported it to the authorities. 64% of tobacco consumers who have not reported the sale of illicit tobacco because it was ‘none of their business’. Click here to read the full report from 2017. Click here to read the full report from 2015. Click here to read the full report from 2014.